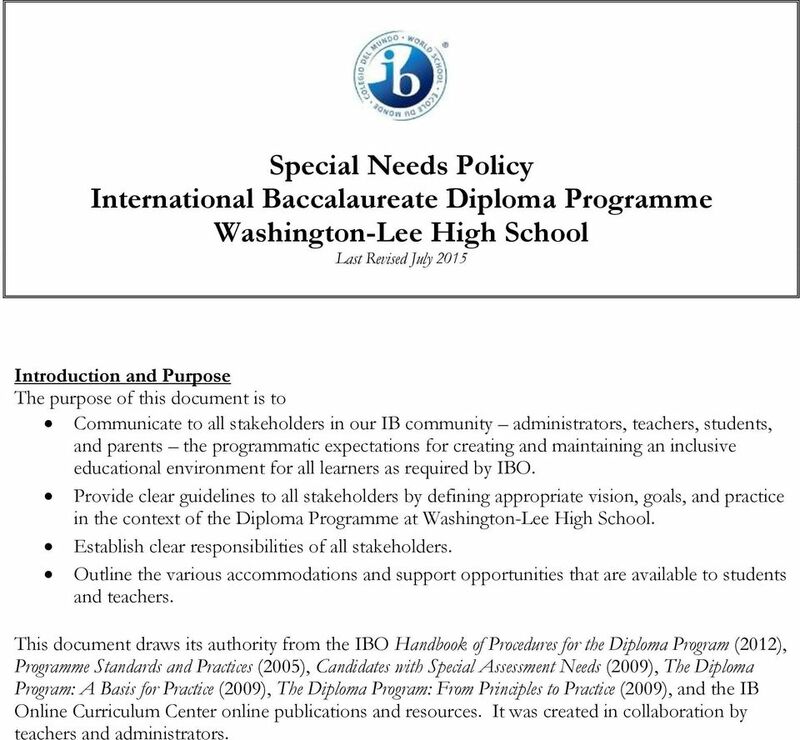 Download "Special Needs Policy International Baccalaureate Diploma Programme Washington-Lee High School Last Revised July 2015"
1 Special Needs Policy International Baccalaureate Diploma Programme Washington-Lee High School Last Revised July 2015 Introduction and Purpose The purpose of this document is to Communicate to all stakeholders in our IB community administrators, teachers, students, and parents the programmatic expectations for creating and maintaining an inclusive educational environment for all learners as required by IBO. Provide clear guidelines to all stakeholders by defining appropriate vision, goals, and practice in the context of the Diploma Programme at Washington-Lee High School. Establish clear responsibilities of all stakeholders. Outline the various accommodations and support opportunities that are available to students and teachers. This document draws its authority from the IBO Handbook of Procedures for the Diploma Program (2012), Programme Standards and Practices (2005), Candidates with Special Assessment Needs (2009), The Diploma Program: A Basis for Practice (2009), The Diploma Program: From Principles to Practice (2009), and the IB Online Curriculum Center online publications and resources. It was created in collaboration by teachers and administrators. 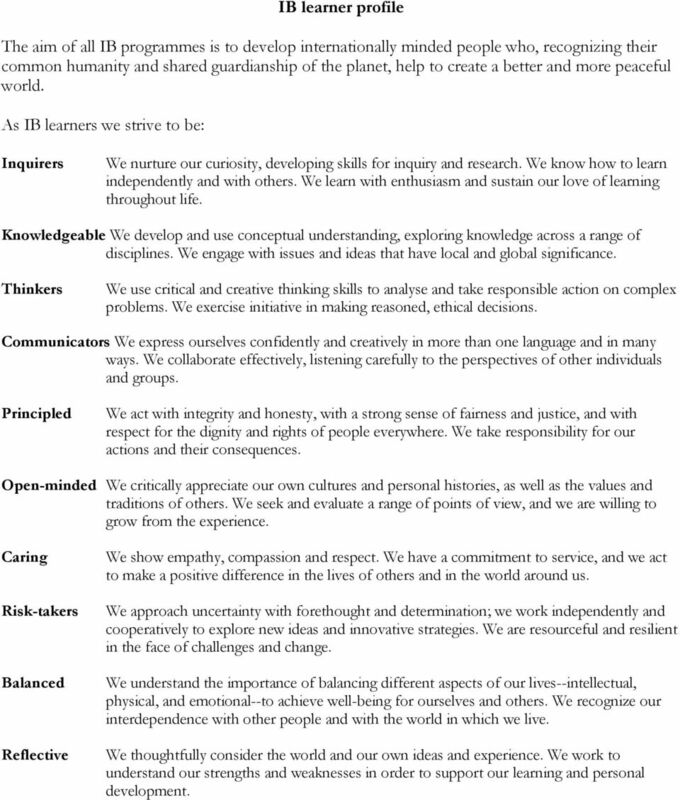 2 IB learner profile The aim of all IB programmes is to develop internationally minded people who, recognizing their common humanity and shared guardianship of the planet, help to create a better and more peaceful world. As IB learners we strive to be: Inquirers We nurture our curiosity, developing skills for inquiry and research. We know how to learn independently and with others. We learn with enthusiasm and sustain our love of learning throughout life. Knowledgeable We develop and use conceptual understanding, exploring knowledge across a range of disciplines. We engage with issues and ideas that have local and global significance. Thinkers We use critical and creative thinking skills to analyse and take responsible action on complex problems. We exercise initiative in making reasoned, ethical decisions. Communicators We express ourselves confidently and creatively in more than one language and in many ways. We collaborate effectively, listening carefully to the perspectives of other individuals and groups. Principled We act with integrity and honesty, with a strong sense of fairness and justice, and with respect for the dignity and rights of people everywhere. We take responsibility for our actions and their consequences. Open-minded We critically appreciate our own cultures and personal histories, as well as the values and traditions of others. We seek and evaluate a range of points of view, and we are willing to grow from the experience. Caring Risk-takers Balanced Reflective We show empathy, compassion and respect. We have a commitment to service, and we act to make a positive difference in the lives of others and in the world around us. We approach uncertainty with forethought and determination; we work independently and cooperatively to explore new ideas and innovative strategies. We are resourceful and resilient in the face of challenges and change. We understand the importance of balancing different aspects of our lives--intellectual, physical, and emotional--to achieve well-being for ourselves and others. We recognize our interdependence with other people and with the world in which we live. We thoughtfully consider the world and our own ideas and experience. We work to understand our strengths and weaknesses in order to support our learning and personal development. 3 Program Philosophy Washington-Lee High School (WLHS) serves the citizens of Arlington, Virginia s geographically smallest county, located across the Potomac River from the District of Columbia. We educate one of the nations most diverse and sophisticated student populations students come from 80 countries and speak 50 different languages. We serve students with a range of programs designed to meet individual needs. Our mission is to challenge all students to strive for the best, to become lifelong learners, and to become successful, active members of the global community. WLHS supports the IBO philosophy that all candidates should be allowed to demonstrate their ability under assessment conditions that are as fair as possible. To that end, WLHS offers an array of accommodations for students found eligible to receive services. These individual needs may include but are not limited to specific learning disabilities, communication and speech difficulties, social, emotional and behavioral difficulties, physical challenges, medical challenges or multiple disabilities. Any faculty member can identify a student for evaluation and assessment. The identification of students who are eligible for special education is a carefully managed process, guided by state and federal regulations. Evaluations required to make this determination are completed at the expense of the school system and only with parent permission. Teachers and parents are part of the team that evaluates students in need of services. An individual education plan (IEP) is developed for each student found eligible for services. This plan is reviewed at least annually. Identification All students experiencing academic and/or behavior difficulties may not have a disability or require special education to meet their individual educational needs. In many cases, modifications to the regular education program will address a student's particular needs without resorting to evaluations or special education services. 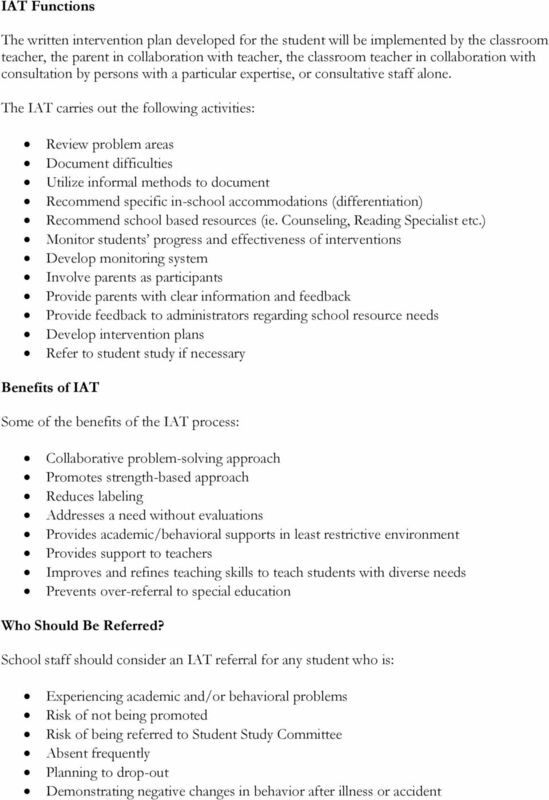 At WLHS, the Intervention Assistance Team (IAT) is an informal collaborative process that is designed to help promote students success in the regular education classroom. Intervention strategies such as alternative or modified learning instruction and/or behavior management techniques may be developed to: improve the student's academic performance improve the student's behavior, or improve and refine teaching skills so that the classroom teacher is able to teach students with diverse educational needs. If the approaches offered through the IAT are effective, the student will experience educational success within the general education program. This will eliminate special education as an alternative. 5 Special Education Cycle Before a child can become eligible to receive special education services, the school is required by law to determine a child's specific needs. The school determines these needs through a process consisting of many steps, often termed the Special Education Cycle. When viewed as an ongoing cycle with several steps along the way, the special education process is easier to understand. 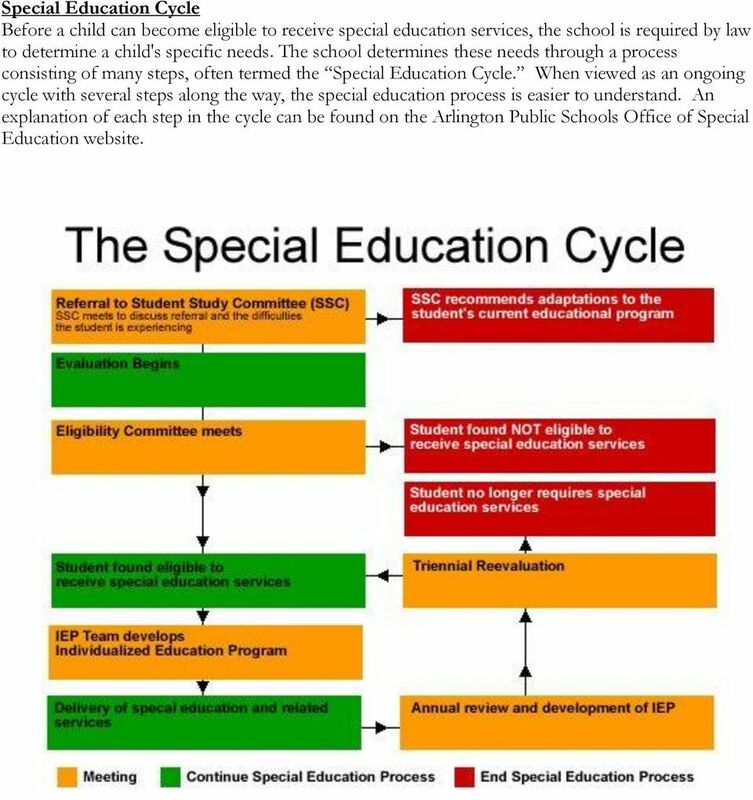 An explanation of each step in the cycle can be found on the Arlington Public Schools Office of Special Education website. 6 Special Arrangements Any student that has either an IEP or a 504 plan is automatically eligible to apply for special arrangements with the IBO to assist the candidate during their preparation of work for assessment and in their written examinations. In November of each year, after the IB exam registration period has ended, the IB Coordinator requests a list of all special needs and 504 students from the WLHS Special Education Department. The IB Coordinator automatically files a D1 form with the IBO for any student with special needs that is enrolled in an IB course. Once the IB Coordinator learns of the decision of the IB, the student, parents, and teachers involved will be informed. Special arrangements may include: Additional time Rest periods Word processor Scribe Readers Communicators Prompters Modifications to examination papers or assignments Transcriptions Extensions to deadlines Assistance with practical work Exemption from one or more assessment components Other arrangement as recommend by committee recommendation and approved by IB WLHS encourages all students to come forward if they experience any adverse circumstances. 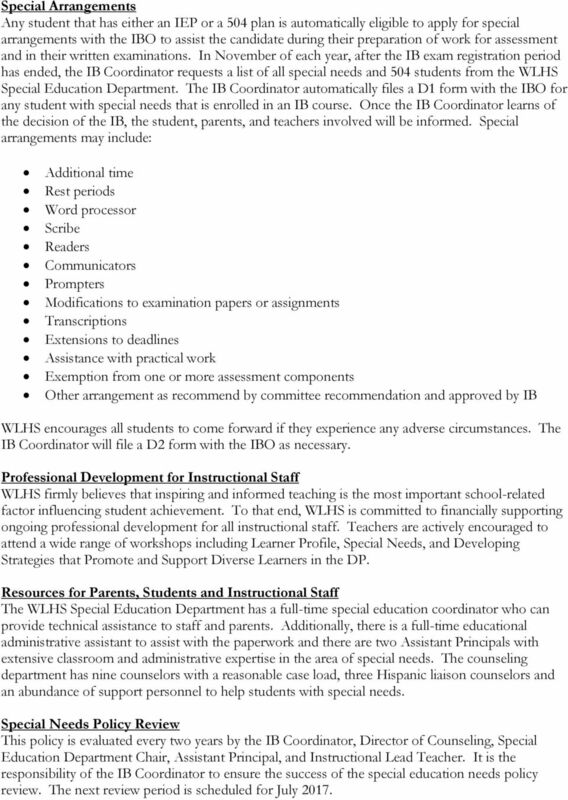 The IB Coordinator will file a D2 form with the IBO as necessary. Professional Development for Instructional Staff WLHS firmly believes that inspiring and informed teaching is the most important school-related factor influencing student achievement. To that end, WLHS is committed to financially supporting ongoing professional development for all instructional staff. Teachers are actively encouraged to attend a wide range of workshops including Learner Profile, Special Needs, and Developing Strategies that Promote and Support Diverse Learners in the DP. Resources for Parents, Students and Instructional Staff The WLHS Special Education Department has a full-time special education coordinator who can provide technical assistance to staff and parents. Additionally, there is a full-time educational administrative assistant to assist with the paperwork and there are two Assistant Principals with extensive classroom and administrative expertise in the area of special needs. The counseling department has nine counselors with a reasonable case load, three Hispanic liaison counselors and an abundance of support personnel to help students with special needs. 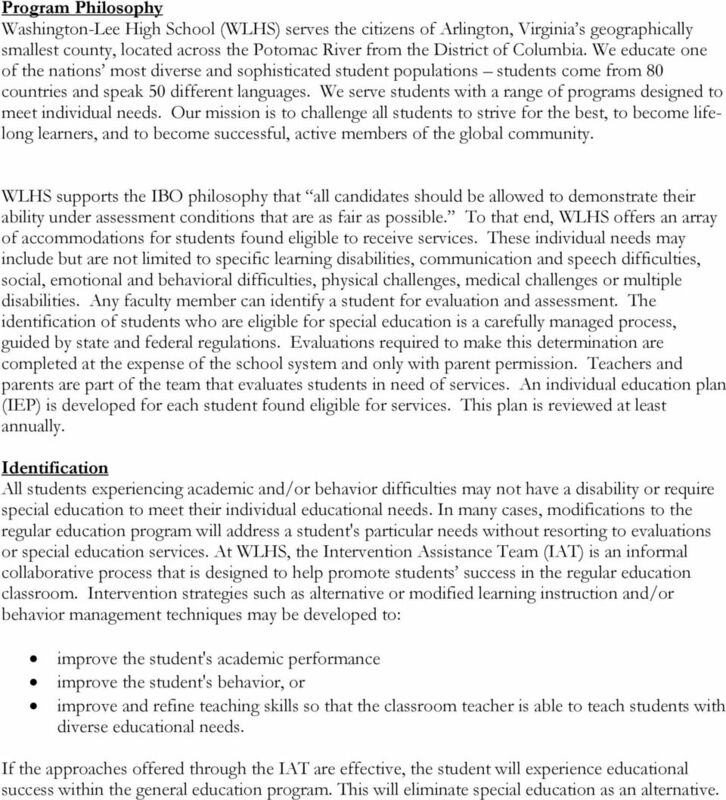 Special Needs Policy Review This policy is evaluated every two years by the IB Coordinator, Director of Counseling, Special Education Department Chair, Assistant Principal, and Instructional Lead Teacher. It is the responsibility of the IB Coordinator to ensure the success of the special education needs policy review. The next review period is scheduled for July 2017.